On this date in 1777, they hanged the macaroni parson at Tyburn. Then, my doctor is none of your schismatics, madam; believes in the whole thirty-nine! and so he would if there were nine times as many. Three years after Foote’s cruel pen gave Dodd’s name immortality, the divine himself was (so he should think) ushered into eternity, after he got caught passing a forged bond against the revenues of his onetime student Lord Chesterfield. Condemned to die for the offense,** a longer-than-usual lag from sentence to execution gave Dr. Simony leave to follow that classic Calvary of errant clerics with a mien of pious self-flagellation that helped his case raised a public outcry for clemency. Dr. Johnson, nevertheless, was the true author, and the old scribbler used it to express some of his particular opinions on the proper staging of gallows-theater. William Dodd (together with another criminal, Joseph Harris: there’s a wonderful profile of this forgotten youth here) had occasion to do just that this day in 1777. 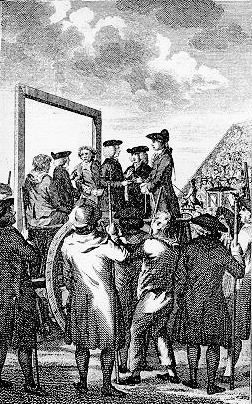 Dodd became the last person hanged for forgery at Tyburn. Updated: According to Wendy Moore, there was an posthumous attempt at resuscitation, which was known to work sometimes. It was, surely, an astounding time to live; no less so, to die. And the mysterious border between the two might be re-engineered by human ingenuity. * The lyrics of “Yankee Doodle Dandy” (“stuck a feather in his hat and called it macaroni”) may be the most recognizable modern-day relic of this lexicon. † Dodd could write a little himself; he had a theological tract and a commentary on Shakespeare already to his name, and at Newgate cranked out Thoughts in Prison, a collection of sub-Villon poetry. Every man reposes upon the tribunals of his country the stability of possession, and the serenity of life. He therefore who unjustly exposes the courts of judicature to suspicion, either of partiality or error, not only does an injury to those who dispense the laws, but diminishes the public confidence in the laws themselves, and shakes the foundation of public tranquility.